A boy died when he was hit by a train after hiding under station platform in Bristol, an inquest has heard. 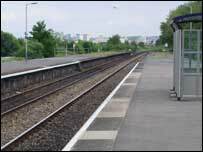 David Hagin, 12, was hit by the Wessex Trains service as it travelled through Bedminster station during the early evening on 23 September, 2004. Witnesses told the inquest that the boy had hid under the platform and then tried to jump out of the way. Recording a verdict of accidental death, Coroner Paul Forrest said: "A tragic incident occurred." He added: "Multiple injuries were caused to this young man." The train was driven by trainee driver Edith Leach, who had been travelling at 30mph through the station - 10mph under the area limit. In a statement from Ms Leach read to the court, she said: "All of a sudden a young lad appeared from under the platform. "There was nothing I could do. There was a bump at the side of the train and I stopped at the next signal." Ms Leach's instructor, Rodney Cox, added: "As we passed I saw the lad leap out and desperately try to jump on to the platform." David died at the scene from multiple injuries. His mother, Margaret, described him as a "reluctant pupil". Louise Smith, his school year head at Aston Park School said he had attendance and punctuality problems, and that he seemed "vulnerable". David had growth spurts that made him taller than most of his classmates, and that had made him the subject of bullies. Outside the court, David's half sister Ruth, 27, said he had been chased by boys previously. Ruth's boyfriend, Jason Mead, 32, added that they believed David used the station as a "den", but that the family were "satisfied with the verdict".